Raskin For Mac is free to try – or just $9.99 to buy. Do many more things with Raskin 2. Among other things, the next generation of our zoomable file browser now lets you sort documents by visual criteria, like principle color or image dimensions. We’ve completely rebuilt Raskin from the ground up for improved performance and a lighter load on your system. This means longer battery life and that on high-end systems you can now see up to 50’000 files simultaneously. A little Helper app will now sit conveniently in your Finder toolbar. Just drag it next to your View options so you can easily switch between list view and Raskin view. To run the Beta you can either get a free Beta license or you can buy your Raskin 2 license for just $9.99. Existing customers: Just download and run, your Raskin 1.x license will be auto-decovered. Folder index navigation and many more enhancements. All folders now show an index of their subfolders for quick access – and a breadcrumb navigation back to their parent folders. Below any selected file, you can now see the icon of the application that the file will open in. 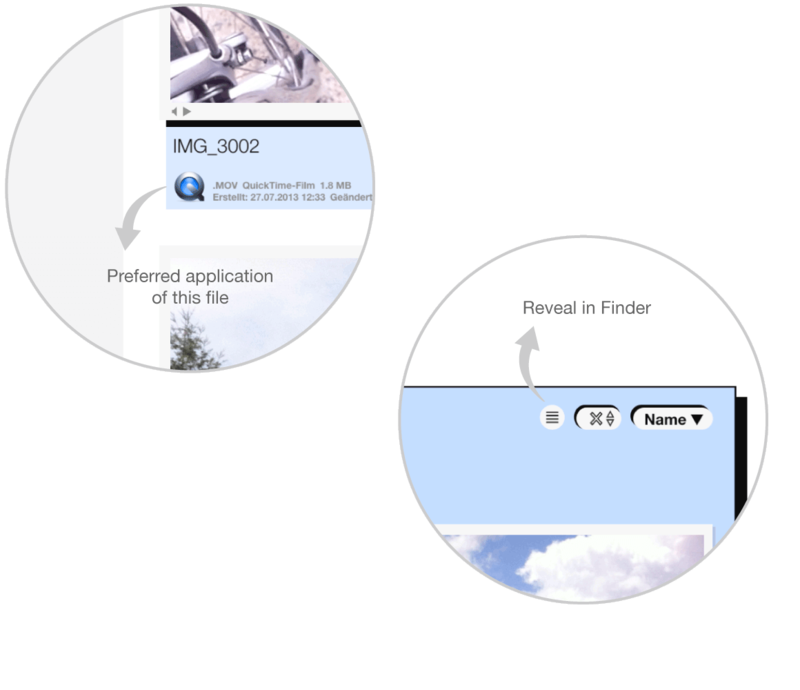 “Reveal in Finder” buttons in the Toolbar and top right within selected folders. New “File > Recent Places” menu gives you quick access to Places that you have hidden from the Surface. Or to Places that have been automatically hidden because they were no longer accessible like from server volumes or external drives. New “File > Add Files And Folders” menu item gives you another option for adding items to your Surface (apart from dragging them to the Surface or dock icon). Please read the following before launching the Beta. With the Beta Program we are looking for all kinds of feedback but especially for reproducible errors. If you find a bug, please try to reproduce it and send us step-by-step instructions in what you did. Make sure “Time Machine” backup is running while using the beta. Make sure you have a recent backup of your computer. In case your Raskin Surface is compromised by the Beta, restore the following file from backup: <your home directory>/Library/Application Support/Raskin/Raskin.archive. This file contains all the layout, size, position and file-related information and you can restore it anytime. If you’d like to have Raskin create a new Surface from scratch, hold down the Option key (⌥) while launching Raskin. Don't hesitate to use the built in feedback forms and to submit crash-reports. Or contact us via . YOU EXPRESSIVELY ACKNOWLEDGE AND AGREE THAT THE USE OF THE SOFTWARE IS AT YOUR SOLE RISK. You’ll probably find all the help you need in our manual. Or contact our friendly support at or select Support from the Raskin Help menu. For exclusive offers, competitions and tips join our newsletter and follow us on Twitter or Facebook.